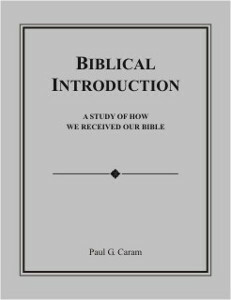 Dr. Caram writes about the history of the most blessed book of all time, the Bible. He discusses our our need to understand why God gave His word to us in the form of a book, why we can place our unwavering trust in the authenticity of this book, how he brought together over forty writers to compose sixty-six books all by one author, the Holy Spirit. These truths and much more are contained within this introductory study of the holy Word of God.